Claudia A. Steiner, M.D., M.P.H., Zeynal Karaca, Ph.D., Brian J. Moore, Ph.D., Melina C. Imshaug, M.P.H., and Gary Pickens, Ph.D. Ambulatory surgery (AS), or outpatient surgery, is a planned operation for which the patient is not expected to be admitted to the hospital. Comparison of ambulatory surgery with inpatient surgery is essential for understanding utilization patterns for specific surgical procedures, including changing trends and estimates of total surgical volumes. As the number of surgical procedures capable of being safely performed in an ambulatory setting increases, comparisons of ambulatory surgery with inpatient surgery can also be useful in the evaluation of post-surgical complications, hospital cost savings, and patient experience of care surveys. Self-reported facility estimates from the American Hospital Association suggest that a growing share of all surgeries at community hospitals in the United States are performed in the AS setting (66 percent in 2014, up from 57 percent in 1994),1 although an ambiguous definition for AS introduces variation across facility volume estimates. Recent reports on specific surgical procedure trends in a subset of States also point to a shift from the inpatient surgical setting to the AS setting.2,3 Nationally representative AS estimates for a broad group of surgical procedures do not yet exist. This Healthcare Cost and Utilization Project (HCUP) Statistical Brief presents national data on surgeries performed in two hospital settings: hospital inpatient and hospital-based AS settings. The findings in this Statistical Brief represent an update and expansion of 2012 statistics previously reported.4 Procedures performed in freestanding (non-hospital-owned) AS centers were not included because many State AS data sources do not include these types of centers. This report presents characteristics of outpatient surgery visits and hospital inpatient stays for invasive, therapeutic surgical procedures. All references to surgeries, outpatient surgeries, or ambulatory surgeries refer to this subset of surgeries. We also present the distribution of outpatient surgeries compared with inpatient surgical procedures by payer, body system, and the most common surgical procedures performed in an outpatient setting overall and by payer. In addition, ambulatory and inpatient volume and procedure rates are compared for each procedure. Unless otherwise noted, volumes and rates are based on all-listed procedure codes. In 2014, 17.2 million hospital visits (ambulatory or inpatient) included invasive, therapeutic surgeries. 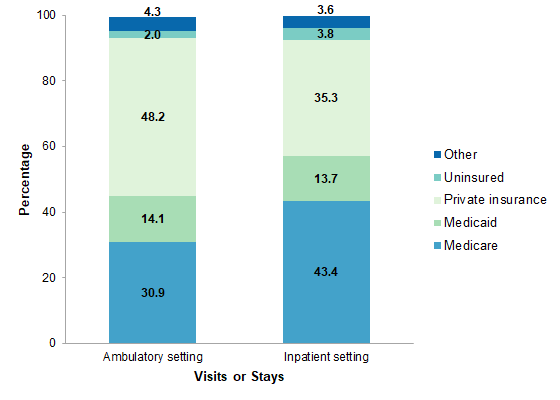 Over half of these visits (57.8 percent) occurred in a hospital-owned ambulatory surgery (AS) setting, and the remaining (42.2 percent) were inpatient. Private insurance was the primary expected payer for 48.6 percent of AS visits. Medicare was the most common payer among inpatient surgical stays (43.4 percent). All differences between estimates noted in the text are statistically significant at the .05 level or better. * Figure 2 of this Statistical Brief was revised to include secondary inpatient surgical procedures that were not included in the original version. This only affected Figure 2 and resulted in an increase in the percentage of surgical visits or stays that occurred in the inpatient setting. Table 1 presents characteristics of community hospital visits for invasive, therapeutic surgeries performed in the ambulatory (outpatient) surgery setting versus the hospital inpatient setting (admitted to the hospital) in 2014. Note: Only invasive, therapeutic surgeries that are performed and reliably reported in the hospital-based ambulatory surgery setting were included. In 2014, 17.2 million ambulatory hospital visits or inpatient stays included an invasive, therapeutic surgery; more than half of these visits occurred in the AS setting. A total of 17.2 million hospital visits (AS visits or inpatient stays) in the United States included at least one surgery in 2014. Just over half of these visits (57.8 percent) occurred in a hospital-owned AS setting, and the remaining visits (42.2 percent) occurred in the hospital inpatient setting. These visits included nearly 22 million total surgeries, over half of which (52.7 percent) were performed in an outpatient setting. The average number of surgeries performed per visit was slightly higher in the inpatient than in the outpatient setting (1.4 vs. 1.2). The majority of ambulatory and inpatient invasive, therapeutic surgeries were performed at large, urban teaching, and private not-for-profit hospitals. Most AS visits and most hospital inpatient surgical stays occurred in large, urban teaching, and private not-for-profit hospitals. However, compared with inpatient surgeries, outpatient surgeries were more likely to be performed in small hospitals (20.0 vs. 15.4 percent) and less likely to be performed in private for-profit hospitals (8.0 vs. 14.7 percent) and in urban teaching settings (57.8 vs. 68.8 percent). Figure 1 presents the distribution of hospital visits or stays involving invasive, therapeutic surgeries performed in the ambulatory (outpatient) surgery setting versus the hospital inpatient setting (admitted to the hospital) by expected primary payer in 2014. Notes: Only invasive, therapeutic surgeries that are performed and reliably reported in the hospital-based ambulatory surgery setting were included. "Other" payer includes Workers Compensation, TRICARE/CHAMPUS, CHAMPVA, Title V, and other government programs. Bar chart that shows the percentage of hospital visits or stays with invasive, therapeutic surgeries in 2014 by expected payer. Ambulatory setting: 30.8% Medicare; 14.0% Medicaid; 48.6% private insurance; 2.0% uninsured; 4.3% other. Inpatient setting: 43.4% Medicare; 13.7% Medicaid; 35.3% private insurance; 3.8% uninsured; 3.6% other. In 2014, private insurance accounted for the largest proportion of AS visits and Medicare accounted for the largest proportion of inpatient invasive, therapeutic surgeries. Patients with primary private insurance coverage accounted for 48.6 percent of all AS visits in 2014. Medicare was the second most common payer, accounting for 30.8 percent of AS visits, followed by Medicaid with 14.0 percent of visits. Uninsured patients represented 2.0 percent of AS visits in 2014. Among surgeries in the inpatient setting, Medicare was the primary expected payer for 43.4 percent of stays, followed by private insurance (35.3 percent) and Medicaid (13.7 percent). Uninsured patients represented 3.8 percent of all inpatient surgical stays in 2014. 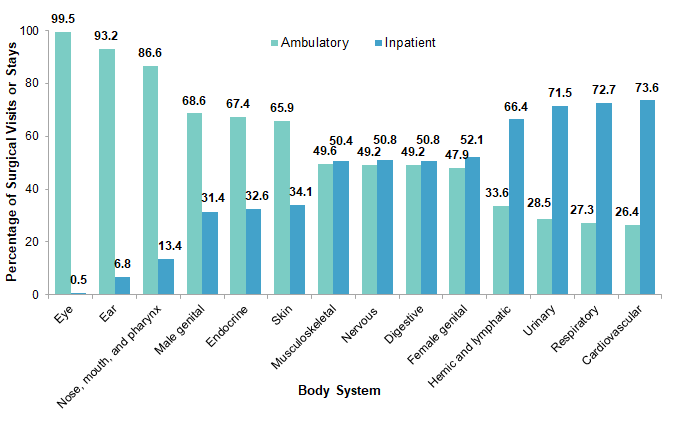 Figure 2 shows the distribution of invasive, therapeutic surgeries by body system that were performed in the AS and hospital inpatient settings in 2014. Notes: Only invasive, therapeutic surgeries that are performed and reliably reported in the hospital-based ambulatory surgery setting were included. Body systems are based on Clinical Classifications Software (CCS) and Clinical Classifications Software for Services and Procedures. Gastric bypass and volume reduction, which is not classified by the CCS, has been included with the digestive body system. Percentage of surgical visits or stays is calculated using unrounded data. Bar chart that shows the percentage of surgical visits or stays in 2014 by body system. Eye: 99.5% ambulatory; 0.5% inpatient. Ear: 93.4% ambulatory, 6.6% inpatient. Nose, mouth, and pharynx: 86.9% ambulatory; 13.1% inpatient. Male genital: 68.8% ambulatory; 31.2% inpatient. Endocrine: 67.3% ambulatory; 32.7% inpatient. Skin: 65.8% ambulatory; 34.2% inpatient. Musculoskeletal: 49.5% ambulatory; 50.5% inpatient. Nervous: 49.3% ambulatory; 50.7% inpatient. Digestive: 49.3% ambulatory; 50.7% inpatient. Female genital: 47.7% ambulatory; 52.3% inpatient. Hemic and lymphatic: 33.4% ambulatory; 66.6% inpatient. Urinary: 28.7% ambulatory; 71.3% inpatient. Respiratory: 26.8% ambulatory; 73.2% inpatient. Cardiovascular: 26.2% ambulatory; 73.8% inpatient. The majority of invasive, therapeutic surgeries on the eye, ear, and nose/mouth/pharynx were performed in an outpatient setting. Nearly all surgeries performed on the eye occurred in the AS setting (99.5 percent). The outpatient setting also represented at least 80 percent of hospital visits involving surgeries performed on the ear (93.4 percent) and nose/mouth/pharynx (86.9 percent). The majority of invasive, therapeutic surgeries on the cardiovascular, respiratory, and urinary systems were performed in the inpatient setting. Compared with the AS setting, more cardiovascular surgeries were performed in the inpatient setting (73.8 vs. 26.2 percent). In 2014, the inpatient setting also represented at least 70 percent of hospital visits involving surgeries performed on the respiratory system (73.2 percent) and urinary system (71.3 percent). Table 2 lists the 25 most common, invasive, therapeutic clinically grouped surgeries that were performed in the hospital-based ambulatory surgery setting in the United States in 2014, along with the percentage of these types of surgeries that were performed in the ambulatory versus inpatient setting. Surgeries are ranked from most to least common in the AS setting. A comprehensive list of the distribution between outpatient and inpatient settings for all specific, invasive, therapeutic surgeries by body system is presented in the appendix. Notes: Only invasive, therapeutic surgeries that are performed and reliably reported in the hospital-based ambulatory surgery setting were included. Procedures are based on the Clinical Classifications Software (CCS) and Clinical Classifications Software for Services and Procedures. For more information on the CCS categories, please see the Appendix. a The number of discharges was rounded to the nearest 100. Lens and cataract procedures were the most common type of surgery performed in the AS setting, accounting for 12.4 percent of all outpatient surgeries performed. Nearly all lens and cataract procedures (99.9 percent) were performed in an outpatient setting. Muscle, tendon, and soft tissue operating room (OR) procedures and incision or fusion of joint, destruction of joint lesion were the second and third most common types of outpatient invasive, therapeutic surgery. Muscle, tendon, and soft tissue OR procedures (mostly rotator cuff repair and trigger finger surgery) were the second most common type of surgery performed in the AS setting, accounting for 6.6 percent of all outpatient surgeries. Incision or fusion of joint, destruction of joint lesion (mostly knee and shoulder arthroscopies) were ranked third, accounting for 5.3 percent of all outpatient surgeries. The majority of both types of procedures were performed in the outpatient setting (71.9 and 80.4 percent, respectively). Four other musculoskeletal system procedures were also commonly performed in the outpatient setting: excision of semilunar cartilage of knee (4.4 percent), non-fracture, non-arthroplasty OR procedures on the bone (2.4 percent), partial excision bone (2.2 percent), and bunionectomy or repair of toe deformities (1.6 percent). Operations on the digestive system accounted for 4 of the 25 most common ambulatory invasive, therapeutic surgeries and constituted 13.9 percent of all outpatient surgeries. Operations on the digestive system accounted for 4 of the 25 most common types of AS and constituted 13.9 percent of all outpatient surgeries: cholecystectomy and common duct exploration (5.0 percent), inguinal and femoral hernia repair (3.8 percent), repair of diaphragmatic, incisional, and umbilical hernia (3.3 percent), and appendectomy (1.8 percent). Approximately 61 percent of all cholecystectomy and all repair of diaphragmatic, incisional, and umbilical hernia surgeries, 92 percent of inguinal and femoral hernia repair surgeries, and 47 percent of appendectomy surgeries were performed in the outpatient setting. Four of the 25 most common outpatient ambulatory invasive, therapeutic surgeries were performed predominantly on women. Four of the 25 most common outpatient surgeries were procedures that are performed primarily on women: OR procedures of skin and breast, including plastic procedures on breast (2.8 percent); lumpectomy, quadrantectomy of breast (2.6 percent); hysterectomy, abdominal and vaginal (2.4 percent); and vaginal, vulvar, and female pelvic OR procedures (1.6 percent). The majority of these surgeries were performed in the outpatient setting. Table 3 lists the five most common, invasive, therapeutic surgeries that were performed in the hospital-based AS setting by payer in 2014, along with the percentage of these types of surgeries that were performed in the ambulatory versus inpatient setting. Surgeries are ranked from most to least common in the AS setting for patients with expected primary payers of Medicare, Medicaid, private insurance, and uninsured. Both lens and cataract procedures and muscle, tendon, and soft tissue OR procedures were among the five most common invasive, therapeutic types of surgery performed in an outpatient setting for all payers. Lens and cataract procedures were the most common type of surgery performed in the AS setting among Medicare patients in 2014, with 987,600 surgeries. More lens and cataract procedures were performed during AS visits than the other four most-frequently-performed procedure categories for Medicare patients combined. Lens and cataract procedures also were among the five most common types of surgery performed among the other payers.. Muscle, tendon, and soft tissue OR procedures were the most common type of surgery performed in the AS setting for privately insured patients in 2014, with 405,300 surgeries, although they were still common ambulatory surgeries among other payers as well. Cholecystectomy and common duct exploration surgeries were in the five most common invasive, therapeutic types of surgery performed in an outpatient setting for Medicaid, private insurance, and uninsured. Cholecystectomy and common duct exploration were common AS procedures for Medicaid (108,200 surgeries), privately insured (328,700 surgeries), and uninsured (14,500 surgeries). The majority of cholecystectomy surgeries were performed in the AS setting among procedures covered by Medicaid and private insurance (61.2 and 71.1 percent, respectively). In contrast, only 32.5 percent of all cholecystectomy surgeries were performed in the AS setting among uninsured individuals. Notes: Only invasive, therapeutic surgeries that are performed and reliably reported in the hospital-based ambulatory surgery setting were included. Procedures are based on the Clinical Classifications Software (CCS) and the CCS for Services and Procedures. Statistics are based on the "narrow" definition of the HCUP Surgery Flag software. c The gastric bypass and volume reduction CCS category (244) does not exist in the ICD-9-CM categorization. Inpatient gastric bypass and volume reductions are included in alternative categories, such as CCS 94, Other upper GI Therapeutic procedures. The estimates in this Statistical Brief are based upon data from the Healthcare Cost and Utilization Project (HCUP) 2014 National Inpatient Sample (NIS) and 2014 nationwide ambulatory surgery analytic file created from the State Ambulatory Surgery and Services Databases (SASD), weighted for national estimates. This report evaluates both inpatient and outpatient surgery data. SASD from 22 States were used to create the nationwide ambulatory surgery analytic file: California, Florida, Georgia, Illinois, Indiana, Iowa, Kansas, Kentucky, Maryland, Minnesota, Missouri, Nebraska, Nevada, New Jersey, New York, North Carolina, North Dakota, Oklahoma, Oregon, Pennsylvania, South Dakota, and Texas. The ambulatory surgery analytic file included 2.0 million unweighted discharges. CCS categorizes ICD-9-CM procedure codes into a manageable number of clinically meaningful categories.8 This clinical grouper makes it easier to quickly understand patterns of procedure use. When CPT was used on ambulatory surgery records, the CCS for Services and Procedures9 was used to classify procedures into groupings comparable to the CCS. The HCUP Surgery Flag software10 was used to identify procedures that are classified as a surgery based on a narrow definition (surgery flag value = NARROW). Records with one or more narrow surgery procedures were retained. All procedures that did not meet the narrow surgery definition were dropped from the record. The HCUP Surgery Flag software11 was used to identify procedures that are classified as a surgery based on a narrow definition (surgery flag value = NARROW). Records with one or more narrow surgery procedures were retained. All procedures that did not meet the narrow surgery definition were dropped from the record. A CCS procedure category was included if it met the above definition for inclusion of ambulatory surgery procedures. This analysis used State Ambulatory Surgery and Services Databases (SASD) limited to data from hospital-owned ambulatory surgery facilities. Although some SASD include data from facilities not owned by a hospital, those facilities were excluded from this analysis. The designation of a facility as hospital-owned is specific to its financial relationship with a hospital that provides inpatient care and is not related to its physical location. Ambulatory surgery performed in hospital-owned facilities may be performed within the hospital, in a facility attached to the hospital, or in a facility physically separated from the hospital. The analysis was further limited to ambulatory surgeries performed at facilities owned by community hospitals. Community hospitals are defined as short-term, non-Federal, general, and other specialty hospitals, excluding hospital units of other institutions (e.g., prisons). We limited the analysis to community hospitals with at least 100 ambulatory surgery visits per year. The unit of analysis is the ambulatory surgery visit or hospital discharge (i.e., the hospital stay), not a person or patient. This means that a person who is admitted to the hospital multiple times in 1 year will be counted each time as a separate discharge from the hospital. The new sampling strategy is expected to result in more precise estimates than those that resulted from the previous NIS design by reducing sampling error: for many estimates, confidence intervals under the new design are about half the length of confidence intervals under the previous design. The change in sample design for 2012 necessitates recomputation of prior years NIS data to enable analysis of trends that uses the same definitions of discharges and hospitals. For other information on procedures and treatments, including procedures in the ambulatory surgery setting, refer to the HCUP Statistical Briefs located at www.hcup-us.ahrq.gov/reports/statbriefs/sb_procedures.jsp. Agency for Healthcare Research and Quality. Overview of the State Ambulatory Surgery and Services Databases (SASD). Healthcare Cost and Utilization Project (HCUP). Rockville, MD: Agency for Healthcare Research and Quality. Updated June 2016. www.hcup-us.ahrq.gov/sasdoverview.jsp. Accessed January 31, 2017. Steiner CA (Institute for Health Research, Kaiser Permanente), Karaca Z (AHRQ), Moore BJ (IBM Watson Health), Imshaug MC (IBM Watson Health), Pickens G (IBM Watson Health). Surgeries in Hospital-Based Ambulatory Surgery and Hospital Inpatient Settings, 2014. HCUP Statistical Brief #223. May 2017. Agency for Healthcare Research and Quality, Rockville, MD. www.hcup-us.ahrq.gov/reports/statbriefs/sb223-Ambulatory-Inpatient-Surgeries-2014.pdf. The authors would like to acknowledge the contributions of Clare Sun of IBM Watson Health. This Statistical Brief was posted online on May 11, 2017. 1 American Hospital Association. Utilization and Volume. In: Trends Affecting Hospitals and Health Systems. Updated for 2016; chapter 3. https://www.aha.org/system/files/research/reports/tw/chartbook/2016/chapter3.pdf. Accessed April 18, 2018. 2 Moore BJ, Steiner CA, Davis PH, Stocks C, Barrett ML. Trends in Hysterectomies and Oophorectomies in Hospital Inpatient and Ambulatory Settings, 2005-2013. HCUP Statistical Brief #214. November 2016. Agency for Healthcare Research and Quality, Rockville, MD. www.hcup-us.ahrq.gov/reports/statbriefs/sb214-Hysterectomy-Oophorectomy-Trends.pdf. Accessed December 5, 2016. 3 Steiner CA, Weiss AJ, Barrett ML, Fingar KR, Davis PH. Trends in Bilateral and Unilateral Mastectomies in Hospital Inpatient and Ambulatory Settings, 2005-2013. HCUP Statistical Brief #201. February 2016. Agency for Healthcare Research and Quality, Rockville, MD. www.hcup-us.ahrq.gov/reports/statbriefs/sb201-Mastectomies-Inpatient-Outpatient.pdf. Accessed December 5, 2016. 4 Wier LM, Steiner CA, Owens PL. Surgeries in Hospital-Owned Outpatient Facilities, 2012. HCUP Statistical Brief #188. February 2015. Agency for Healthcare Research and Quality, Rockville, MD. www.hcup-us.ahrq.gov/reports/statbriefs/sb188-Surgeries-Hospital-Outpatient-Facilities-2012.pdf. Accessed December 2, 2016. 5 Agency for Healthcare Research and Quality. HCUP Surgery Flag Software. Healthcare Cost and Utilization Project (HCUP). Rockville, MD: Agency for Healthcare Research and Quality. Updated May 2013. www.hcup-us.ahrq.gov/toolssoftware/surgflags/surgeryflags.jsp. Accessed November 21, 2016. 6 The narrow surgery definition includes surgical procedures that involve incision, excision, manipulation, or suturing of tissue that penetrates or breaks the skin; typically require use of an operating room; and also require regional anesthesia, general anesthesia, or sedation to control pain. 7 Barrett M, McCarty J, Coffey R, Levit K. Population Denominator Data for Use with the HCUP Databases (Updated with 2015 Population Data). HCUP Methods Series Report #2016-04. September 29, 2016. U.S. Agency for Healthcare Research and Quality. www.hcup-us.ahrq.gov/reports/methods/2016-04.pdf. Accessed January 31, 2017. 8 Agency for Healthcare Research and Quality. HCUP Clinical Classifications Software (CCS) for ICD-9-CM. Healthcare Cost and Utilization Project (HCUP). Rockville, MD: Agency for Healthcare Research and Quality. Updated October 2016. www.hcup-us.ahrq.gov/toolssoftware/ccs/ccs.jsp. January 31, 2017. 9 Agency for Healthcare Research and Quality. HCUP Clinical Classifications Software for Services and Procedures. Healthcare Cost and Utilization Project (HCUP). Rockville, MD: Agency for Healthcare Research and Quality. Updated May 2014. www.hcup-us.ahrq.gov/toolssoftware/ccs_svcsproc/ccssvcproc.jsp. Accessed October 31, 2016. 10 Agency for Healthcare Research and Quality. HCUP Surgery Flag Software. Healthcare Cost and Utilization Project (HCUP). Rockville, MD: Agency for Healthcare Research and Quality. Updated February 26, 2016. www.hcup-us.ahrq.gov/toolssoftware/surgflags/surgeryflags.jsp. Accessed October 10, 2016. Internet Citation: Statistical Brief #223. Healthcare Cost and Utilization Project (HCUP). April 2018. Agency for Healthcare Research and Quality, Rockville, MD. www.hcup-us.ahrq.gov/reports/statbriefs/sb223-Ambulatory-Inpatient-Surgeries-2014.jsp?utm_source=ahrq&utm_medium=en1&utm_term=&utm_content=1&utm_campaign=ahrq_en6_6_2017.